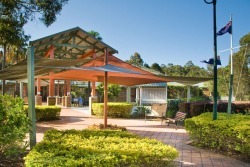 Established in 1994, St Andrews Lutheran Aged Care is located in an expansive semi-rural setting in the Tallebudgera Valley capturing mountain and valley views. St Andrews Lutheran Aged Care provides a range of community living options including a 72 bed residential aged care service and 24 one and two bedroom independent living units. St Andrews employs 78 qualified staff, complemented by 32 volunteers co-ordinated by the Chaplain. Residents at the friendly community benefit from extensive recreational facilities including a swimming pool, spa, cinema, library, internet café and garden relaxation areas.